T-Shirt Chocolate MEDIUM was relased in August 2015 and is our 49067th best seller. The ISBN for T-Shirt Chocolate MEDIUM is 612978287422. Be the first to review T-Shirt Chocolate MEDIUM! Got a question? No problem! Just click here to ask us about T-Shirt Chocolate MEDIUM. Please can you tell me the chest measurements of these T shirts? A:Here is the page for the same product, but with significantly more information about this product, not that you would need to order from that page. 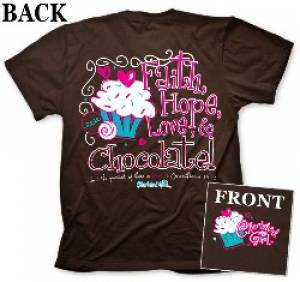 (https://www.eden.co.uk/shop/faith-hope-love-chocolate-t-shirt-brown-adults-medium-4061329.html) Thank you for using the Q&A Forum.